SUMMARY: Continues the story of Day and June, two friends from opposite sides of the tracks who are fighting against the corrupt and oppressive Republic government. In this second book in the Legend trilogy, Day and June join forces with the Patriots and their plot to assassinate the new Elector. But June becomes conflicted about the plan when she meets the young new Elector and discovers that he is different from his father. This new Elector wants to change The Republic, disband The Trials, and end the war with the colonies. REVIEW: Prodigy is one of my most-anticipated sequels of this year, and while it took me For.Ev.Er. to get into this story, I am pleased with it for the most part. I love how, like June and Day, I was conflicted about whom to trust. Can this new Elector (named Alden) really be trusted, or is he just a smooth talker? Not predictable at all, and I love that! So why did it take me so long to read? Well, for one, I started it just before the start of a new school year, which always slows me down. I am sooooo busy at this time of year! But it was also the book itself. The beginning was SLOW, and the whole thing included way too much politics and assassination plot details. These are necessary details, but I frequently find myself skimming when the politics go on and on. 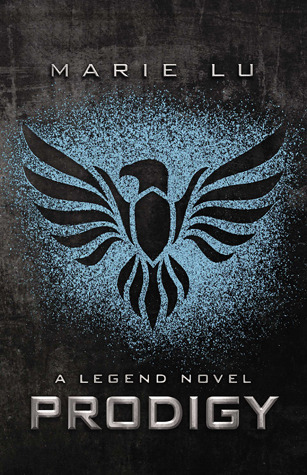 Also, it's been over a year since I read Legend, so I didn't remember much beyond the basics. Lu does rehash some of the plot from Legend, but it is enveloped into the story and not with tons of detail (a good thing for those who read it right after reading Legend). I had a hard time connecting with the characters in this one, a problem I did NOT have with Legend. I think that may partly be because it's been so long since I read Legend; I just didn't feel the characters like I did with the first book. For me, Day and June had much less chemistry in this book. The new couple certainly has their problems to work out, and some drama is added in with Tess (who was in Legend) longing for Day and the new Elector (briefly in Legend) setting his sights on the lovely June. The Tess/Alden love square adds more drama to an already complicated romance between two young people unwittingly swept up in a political tug-of-war. Despite my mixed feelings about the characters and boredom with the politics, I loved the action scenes, particularly at the end. Once I got to a certain point, I couldn't put Prodigy down, and it stayed exciting right to the last page. Overall, I think this is a strong second book in the trilogy and that readers will mostly love it. THE BOTTOM LINE: While it took me forever to get into the story, I loved the world-building and action toward the end. I look forward to reading Champion when it comes out in November. Middle school students (both boys and girls equally) LOVE these books. This trilogy is an absolute must for any library that serves teens. STATUS IN MY LIBRARY: We have multiple copies as this series is extremely popular with my middle schoolers. Both Legend and Prodigy are checked out frequently. Engrossing: 2/5--took me TWO WEEKS to finish! I keep being told to read this series. I just started Divergent and love Hunger Games. Maybe I will pick it up.